Applications for most of the FAIMER fellowship programs are now open. Applications are currently being accepted for the 2017 Brazil-FAIMER Regional Institute, CMCL-FAIMER Regional Institute, GSMC-FAIMER Regional Institute, Manipal University-FAIMER International Institute for Leadership in Interprofessional Education (MUFIILIPE), PSG-FAIMER Regional Institute, and Sub-Saharan Africa-FAIMER Regional Institute (SAFRI). The application for the 2018 FAIMER Institute is also now open. The application for the 2017 CMB-CMU-FAIMER Regional Institute will open on September 1, 2016. For more information or to apply, visit: https://faimer.fluidreview.com/. 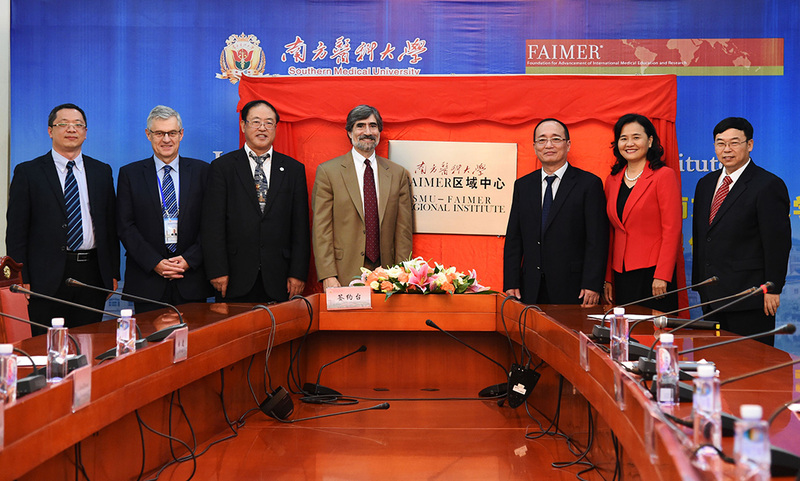 FAIMER is pleased to announce that a new Regional Institute will launch at Southern Medical University (SMU) in Guangzhou, China in November 2016. Representatives of FAIMER and SMU met in Guangzhou in November, where they signed a Memorandum of Understanding outlining their plans for academic cooperation and exchange. The SMU-FAIMER Regional Institute will launch under the direction of 2010 FAIMER Institute Fellow Zhimin Jia, Deputy Dean of the School of Pharmaceutical Sciences at SMU. FAIMER Institute Fellows Wei Li (2013), Lin Lv (2015), and Shanchao Zhao (2015) are expected to serve as faculty. Present at the signing were SMU Party Secretary Minsheng Chen, President Yanhong Yu, and Vice President Mingang Wen, as well as FAIMER Vice President for Education William Burdick. David Ellwood, Deputy President of the Australian Medical Council and Chair of its Medical School Accreditation Committee, and CMB-CMU-FAIMER Regional Institute Director Bo Qu and Senior Faculty Baozhi Sun were also in attendance.